People who have worked with engineers and architects are familiar with the piece of paper known as a blueprint. This is the method used in copying large construction and architectural drawings. Blueprints are the original or future plans and designs of a home, building or an addition to a structure. They include vital data regarding the equations that are used in their construction. These prints make sure that the structure will be properly built, following the correct measurements. For these reasons, blueprints are important, and they need to be kept in a secure place, with the help of blueprint storage solutions. There are different kinds of blueprint storage solutions, and it is always important for users to choose the ones that would best suit their needs. In this regard, there are some factors that they need to consider before making their purchase. First of all, it is important to determine the number of blueprints that people want to store. They should also have an estimate on the development of this collection in the future. They may need a quick retrieval of plans. So, this requires the storage solution to be located near the people who use these files the most. It is not practical to keep these important documents in a storage room that is far from the users, when they often need them. There are certain blueprints that need to be kept secure so they need a storage solution to keep them protected, yet readily available..
Blueprints can be reproduced easily when they are backed up by a computer network administrator. This is an advantage in case a disaster like fire happens. However, when drawings are drawn by hand, contain important notes or happen to be the only available copies, these can be lost forever to disasters such as this. So, it is best to find a storage solution that will protect their valuable investment. Flat file cabinets are made of durable steel construction, allowing it to store large and heavy format documents. The 5-drawer files can hold up to 500 active files, 750 semi-active files and 1000 inactive files. The 10-drawer files enable quick retrieval of files. 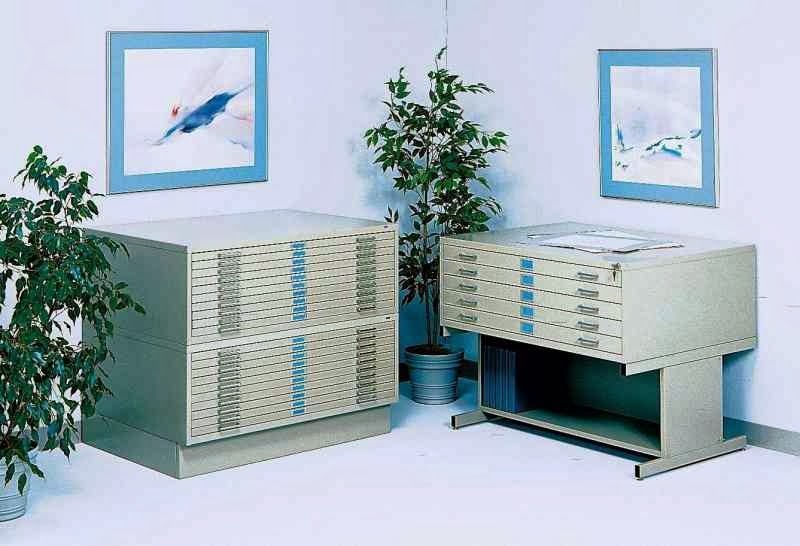 Flat files provide a bigger capacity and more protection than any other storage solutions. These provide a variety of options for rolled storage such as upright roll files and blueprint storage tubes, among others. Roll files give the advantage of lower costs and the ability to be situated near workers so that they can have easy access to the drawings that they need. These can also offer more protection for blueprints. Also known as blueprint holders and vertical files, they offer fast and easy access to the prints that people often use. Moreover, they can be placed close to those who need them the most. They are more convenient and flexible than either flat or roll files. When it comes to caring for important files such as blueprints, people can choose from the different storage solutions that offer their own advantages. Most users opt for multiple storage systems to meet their different needs such as quick retrieval, better security, lower costs and more protection for their investments.